Bzzz..What’s that? Oh, it’s my Pebble! – Arbitrary Musings..
Bzzz..What’s that? Oh, it’s my Pebble! 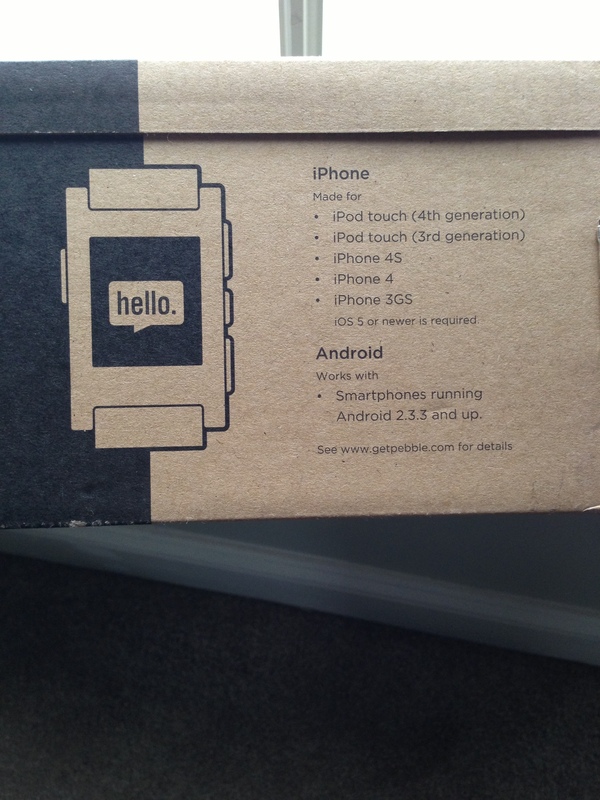 So last year when Pebble was announced on Kickstarter I was really excited about the potential of it. I mentioned it in passing to my technophobic wife. It seems I was correct in my choice of partner because a month or two later when my birthday rolled around she presented me with my backer receipt. Totally. Awesome. Well, fast forward several months and some understandable delays later, and I recently got a notification that my Pebble had shipped. Needless to say I was checking the mailbox with kid-on-Xmas-morning anticipation daily. Today it finally arrived. The packaging is low-key but certainly functional. They also had the foresight to make the packaging about as frustration free as you can get this side of Amazon. 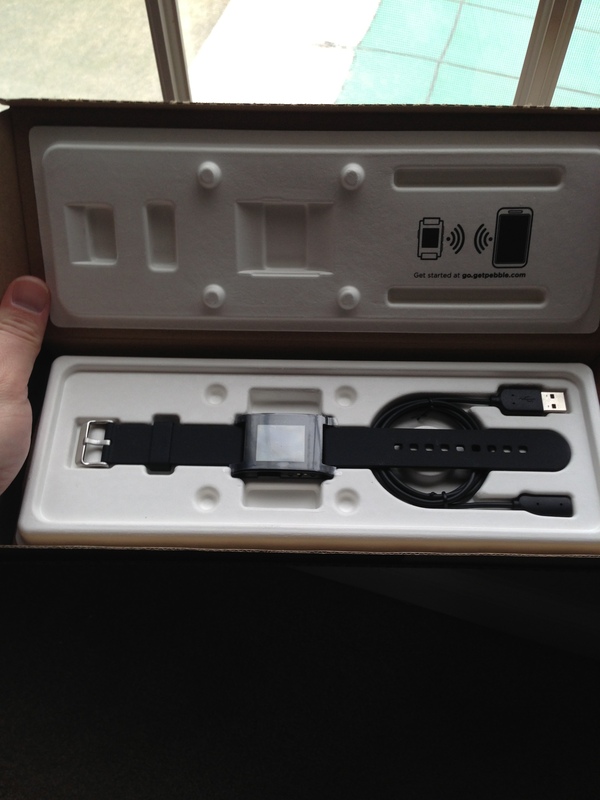 Once open you are presented with the watch and the charging cable, which is of the USB to proprietary Pebble variety. I suppose this was a necessary choice to make the watch water resistant to 5ATM. Needless to say, the watch is safe in the shower. So the first thing I noticed, or felt was that the watch is smaller than I had pictured in my mind. It’s by no means small, but surprisingly compact. It’s very light and looks exactly as it is pictured on the site. I didn’t have to order a larger band so it has the normal sized band which fits great and should work for most folks. As you can see it is about the same size as my Seiko diver. It also takes a standard sized watch band so you can change it out to your hearts content. 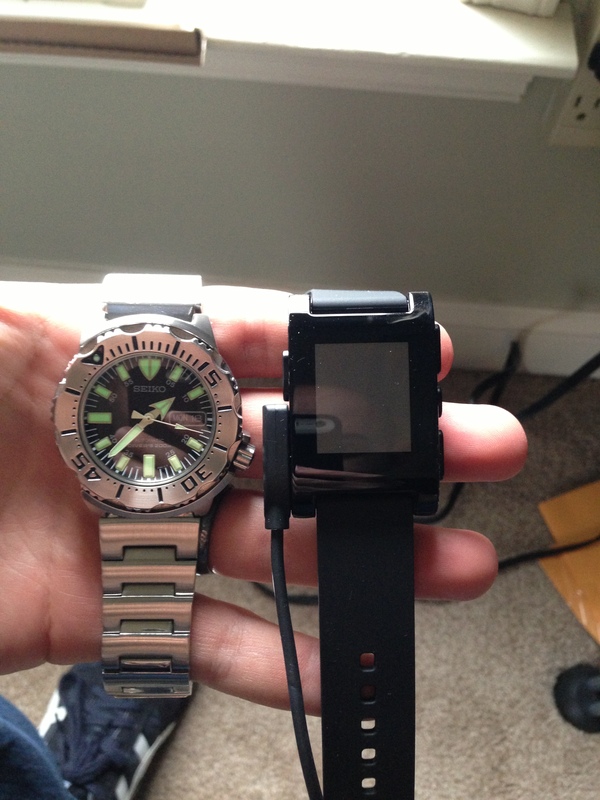 The pic here also has the charging cable attached to the side of the Pebble. It’s very Magsafe-esque and works well. All in all, it’s a perfectly serviceable size and wears comfortably. I use an iPhone 5 as my daily driver and had already downloaded the Pebble app for iOS. Set up was dead simple. They make it really easy to pair the device and give you dead simple directions to set up your notifications. Under the BT menu you enable notifications on the Pebble and then you make sure the notifications you want to see are enabled in the Notification Center. Quite simple. It’s not quite as flexible as the Android version from what I have read but it is certainly functional. I have notifications set up for SMS/iMessage and Mailbox and both work great. I did immediately notice that you only see the last message you received. That is a bummer but I would imagine it is high on the Pebble team’s priority list. The ability to scroll through your notifications would make it much more usable for very heavy users. Speaking of which, the Pebble team is still in it’s infancy as far as the SDK and Apps go. They just announced they would be releasing the .0 version of the SDK in April that will only have watch faces, which will be cool. I like the variety of the currently available faces but things could get even more interesting. 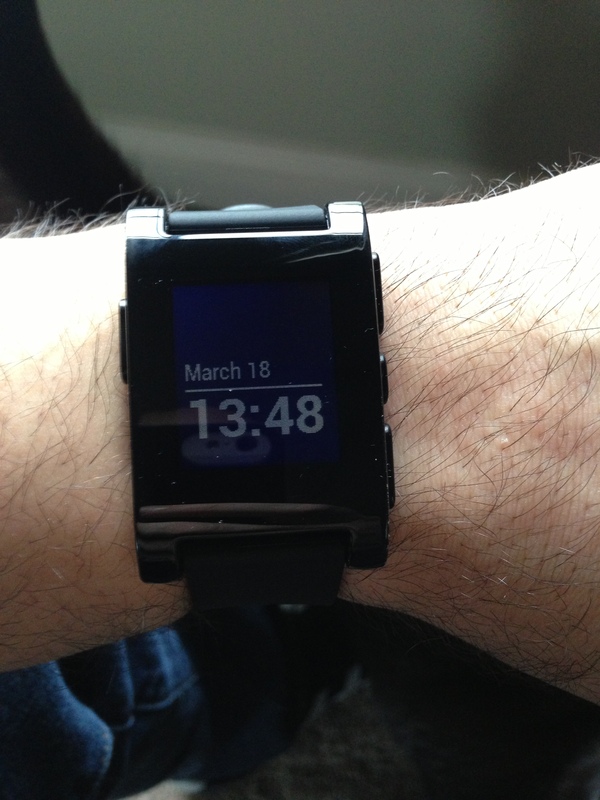 View of one of the Pebble watch faces. Next Next post: Up Up and Quantify..